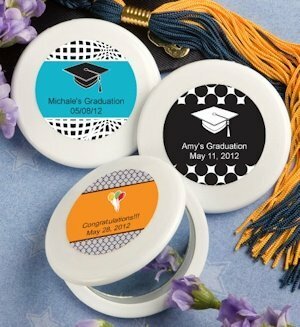 Celebrate your graduate with a favor that reflects their outstanding achievements! A memento that is as fashionable as it is functional, each 2 1/2" round compact mirror has a double sided glass mirror interior with a sturdy white poly resin outer compact case, hinged for easy open/close. Personalization included, choose from a variety of designs and colors along with 2 lines of custom text to create a one-of-a-kind gift.